As the years pass by, not a day goes by where I am constantly reminded of my past and how it has shaped the person I am today. As most of you already know, in 2011 I was diagnosed with a central nervous system disorder called Reflex Sympathetic Dystrophy (RSD) whose main symptom is chronic pain. When I was first diagnosed, I thought of this disease as a curse that I had no choice but to accept. I always questioned why I was the one who was chosen to face this painful condition while all of my friends were living happy and comfortable lives. However, if you ask me today, I would definitely say otherwise. This "curse" I was ultimately forced to live with turned out to be a blessing in disguise. RSD has helped me in so many positive ways. It has helped to make me stronger and more compassionate towards others. I truly believe I was chosen because I had the strength to persevere in many different ways. Since my treatment at the Children’s Hospital of Philadelphia (CHOP) I have been able to help by giving back to others, similar to myself, more than I could have ever imagined. Here are stories from some of the people I was able to help along the way. 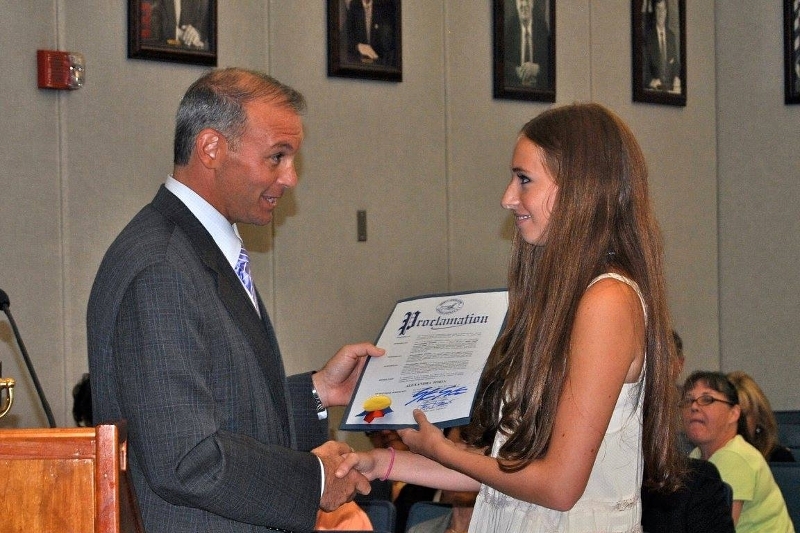 Carly Ringel was 11-years-old when she was diagnosed with RSD. She and her parents read my story on my fundraising page, and they reached out to me when Carly was first diagnosed. 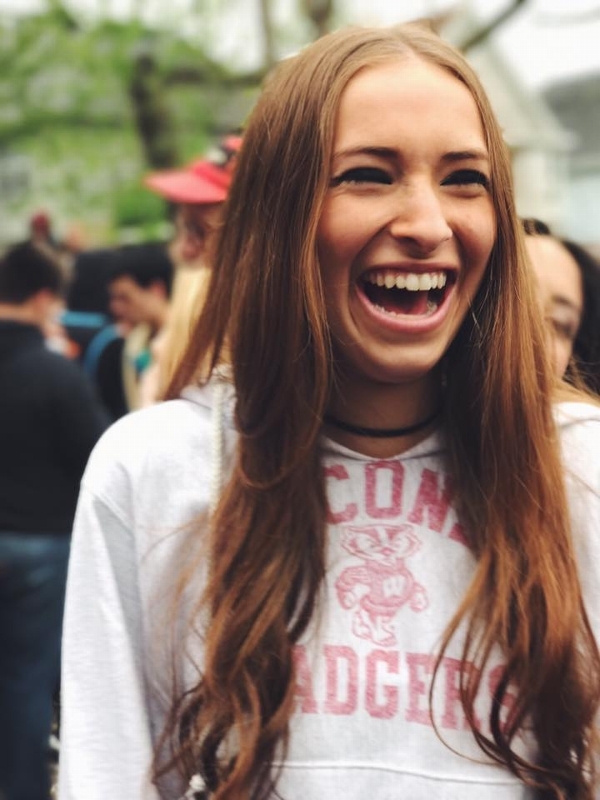 As most RSD patients and their families would be, Carly and her parents were extremely anxious and concerned with how this could impact Carly’s life. It’s hard to really understand the impact of RSD unless you are the one experiencing it firsthand. Being a part of the Pediatric RSD program at CHOP has enabled me to connect with other patients who suffer in the same way I do. As much as I remain immensely grateful for all the support I receive from both friends and family, it’s comforting to know there are others out there who go through the same experience I have – and this is why I continue to strive to raise funds for Dr. Sherry’s pediatric program. Since the inception of my fundraiser, we have raised over $175,000 with close to 1,000 individual donations to date. My campaign has raised 2446% more than the average campaign sponsored at CHOP which brings such gratification because I know that together we are all making an impact on the lives of children who face the same disease that I do. 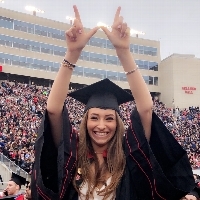 Six years later, as a happy and healthy Junior at the University of Wisconsin-Madison, I continue to ask for your ongoing love and support to help me help others who are afflicted with RSD. This past year, various people have come to me asking for a helping hand during a difficult time in their life due to this debilitating disease. I was able to give these individuals as much support as possible, but I always wanted to help more. Unfortunately, as I have stated in the past, the waitlist to be admitted into the program is lengthy. The longer one waits to treat RSD, the worse the condition can get over time. This is why your contribution is so important to me. It allows CHOP to extend their program so that NO kid has to wait in pain longer than necessary to be admitted. My waiting period was 6-months, and not only did my condition worsen during this time, but I became completely immobile by the time I was admitted into the program. This is why I ask you for your help each year. No one should have to face this struggle the way that I did. With your past help, together we have achieved close to 90% of my goal to raise $200,000 for Dr. Sherry’s Pediatric RSD Fund at The Children’s Hospital of Philadelphia. Reaching my goal would allow us to continue to expand the program even more than it already has. It would help to increase the amount of physical and occupational therapists on staff, as well as the amount of spots they have in both their inpatient and outpatient program. With your continuous generosity, you can help me to make an impact by changing someone’s life. Coming from experience, this would mean the world to them and me. Any donation at all will help to make a difference. As always, thank you so much for all of your past help as well as for what’s to come. For the past 5 years, I’ve come to you all asking for your ongoing love and thoughtfulness to help support a cause that holds a very important place in my heart. Everyday I reflect back on my past which reminds me of how grateful I am to have the treatment I was able to receive from The Children’s Hospital of Philadelphia (CHOP). It also helps to remind me of how appreciative I am for the amazing support system I had, and still have, from both my family and friends. Without your constant help throughout the past several years, I wouldn’t be where I am today – fully functional, walking on 2 feet and as happy as ever. For this reason, I am asking you again for your continuous support to please help me raise funds for those struggling children who suffer from the same disease that I do. Reflex Sympathetic Dystrophy, otherwise known as RSD, can afflict any person at any given time without warning. Within moments, this instantly changes one’s life. I can definitely say that it changed mine. It impacted my life in ways that I could have never imagine - especially being only 13 years old when I was first diagnosed with this painful disorder. I am now more thankful than ever to be able to move on each and every day feeling healthy and stable. And that’s why I need your help, so that together we can help make a positive influence on other’s who continue to suffer to this day. No one deserves to go through such excruciating pain and discomfort, and with CHOP’s help, a child or teen is able to get the help they need to help overcome this horrible disorder. Although this was a significant battle that I had to face, it has shaped the person I am today in so many aspects. I now have a completely different outlook on life, and take advantage of every opportunity that I can to help others in need. Nothing makes me happier than to hear this news knowing that our community is raising awareness for RSD in order to help a cause that is so meaningful and influential in my life. Throughout the years, together we’ve raised signifigant funds that go directly to the RSD program at The Children’s Hospital of Philadelphia to help other suffering children and teenagers to fight through this disease and battle their way to victory – just like I was able to. I am confident that this year will be another successful year, and that we can all continue to help others in need. With this in mind, together we can impact someone’s life significantly. Any donation you choose to give can help to make a difference. I’d like to thank you in advance for your consistent love and support. Subject: Resolution Declaring November "Complex Regional Pain Syndrome Awareness Month"
I hope that you are doing well. 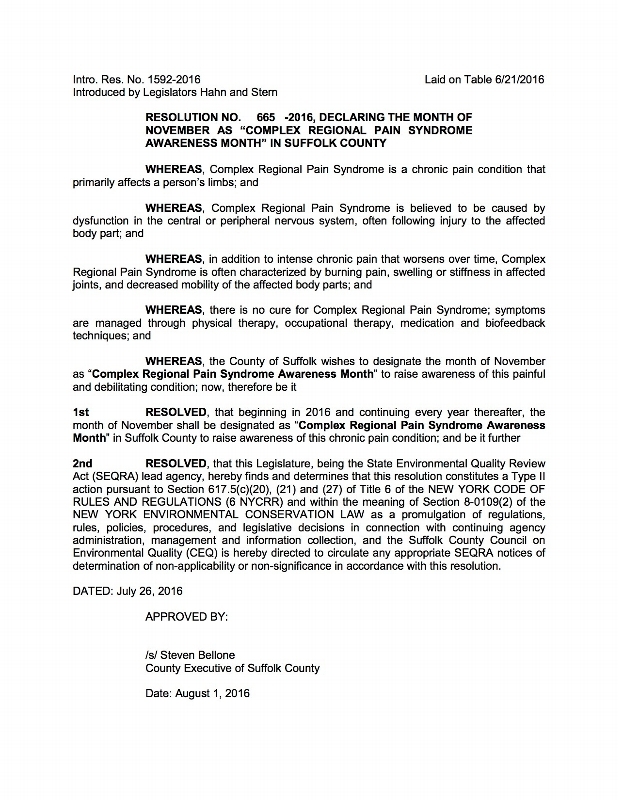 I just wanted to send a copy of a resolution that Legislator Stern co-sponsored and that was passed by the legislature yesterday to declare the Month of November as “Complex Regional Pain Syndrome Awareness Month” in Suffolk County. As always, if I can be of assistance to you in any way, please feel free to contact me. Each year I've come to my family members and close friends asking for your continuous support. Reflex Sympathetic Dystrophy (RSD) has played such an important role in my life throughout these past several years. Although it was one of the most tragic moments of my life when first diagnosed, it has taught me that I can push through almost absolutely anything. RSD is a rare nervous system disorder whose main symptom is pain. This pain is caused mainly from stress and occurs most of the time. From my personal experiences with RSD, I have learned so much about what is most important in life and have grown significantly as a person. Everyday that passes I remember how thankful I am to have gotten the support and help that I needed to be where I am today. With all of your love and devotion to my fundraiser, together we have helped so many kids who struggle from the same condition as I do. Collectively we have raised close to $150,000 which gave the Children's Hospital of Philadelphia the ability to extend their inpatient/outpatient program in ways that no one could have ever imagined. As a result, I received recognition from both the New York State Legislatures as well as the Town of Huntington for my efforts. Since starting this fundraiser back in 2011, I feel good about myself as an individual and believe this is something I want to continue doing further in my life. This is why I decided to make my major Community and Nonprofit Leadership from the School of Human Ecology at the University of Wisconsin-Madison. I hope to strive to even greater heights throughout my life, by helping so many more people in whatever way I can. I couldn't be more thankful to each of you who have always stood by my side and helped me throughout the way. For that, I am eternally grateful. The most important thing I've learned about myself through these past several years is that I can help make a significant impact on other peoples lives. With that being said, I'd like to ask each and every one of you to continue with your ongoing generous support to my RSD fundraiser. Please help me so Dr. Sherry can continue to help other kids like myself who suffer from this terribly painful disorder. Together I am confident we can raise even more funds than ever imagined. Any donation can help make a difference. Thank you all for your past donations and I look forward to seeing what the future holds for the Reflex Sympathetic Dystrophy program at CHOP. Well, what an exciting year it has been for the RSD program at The Children's Hospital of Philadephia (CHOP). Our fundraiser last year helped increase total contributions to $115,000. Your support continues to help Dr. Sherry and his team obtain the additional resources needed to build upon their success in treating more and more kids each year. Yay! In addition, what's even more gratifying is the recognition I received from your generous support. 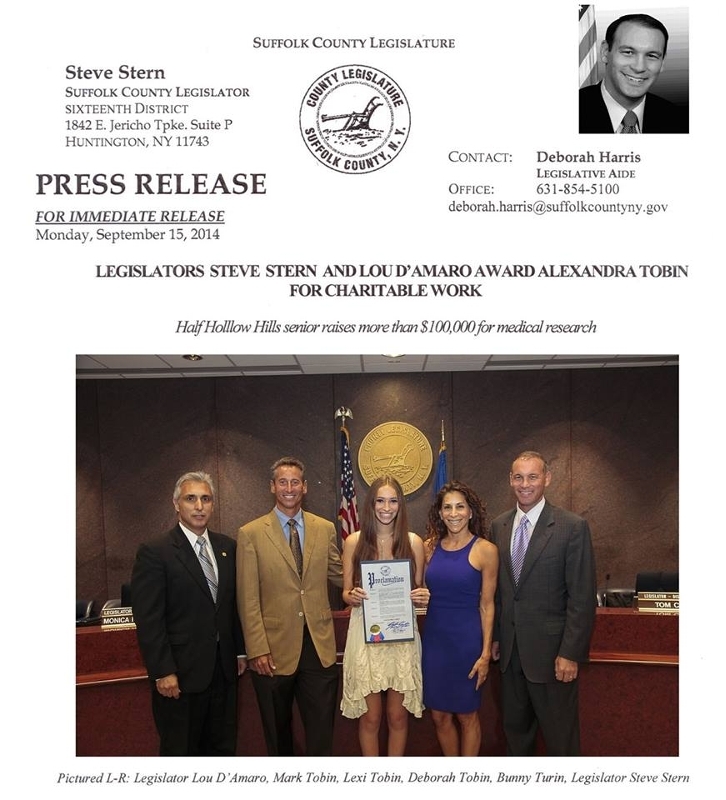 I want to share with you a press release that went out on September 15th, 2014 recognizing us all for our charitable work. If this recognition was not enough, on November 6th, 2014, The Town of Huntington recognized our collective efforts as well. 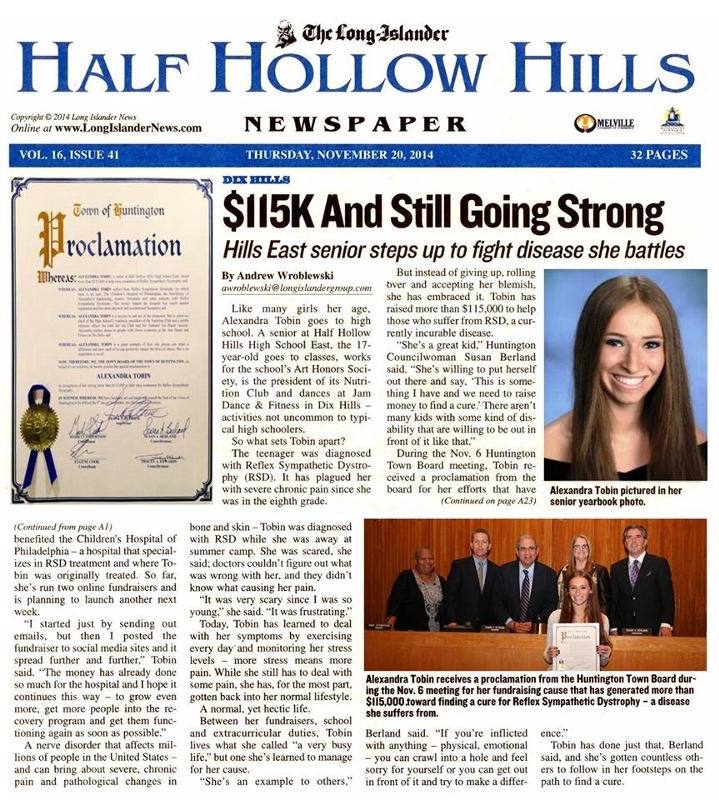 Our story was featured on the front page of The Long Islander Half Hollow Hills Newspaper, as well as the "Way to Go" section of Newsday. I want to thank Suffolk County Legislatures Steve Stern and Lou D'Amaro, Town Supervison Frank P. Petrone, Councilwoman Susan A. Berland, Councilman Mark Cuthbertson, Councilwoman Tracey A. Edwards and Councilman Eugene Cook for all their support and recognition! If you recall years ago, during our first years fund raising initiative, my parents wrote the following: "So, we began this letter to you by stating RSD can happen to anyone at anytime, but what we did not say is this may have happened to Lexi for a reason. It happened to us because we can make a difference. We will start now with RSD, but eventually this can and will become something much broader than any one disease. It really comes down to this one simple thing for us: In life, people will need our help along the way . . . we will help them!" Four years later it appears my misfortune did have a silver lining. No matter how difficult things appeared, my family and I always remained positive and knew good things would come. It did, and we are all so grateful for this. Let's keep doing great things together. Your support means so much to me, no matter how much the amount. It's Fall and Thanksgiving is right around the corner. It's a time when I think about the things in my life I am most grateful for. There is so much, but there is no doubt in my mind that one of those on the top of my list remains The Children's Hospital of Philadelphia, Dr. Sherry, and his amazing staff who all help to make the Pediatric RSD program at CHOP, one of the best in the country. I will always remain grateful to CHOP for what they did to help treat my pain, and I am most thankful to each of you for all your love, caring and generosity to help me support a program that is very important to me. It's been three years since I was diagnosed with a neurological disorder called Reflex Sympathetic Dystrophy (RSD). It is a rare nerve disorder that affects my central nervous system, which at the time resulted in constant and excruciating pain. So much so, it greatly limited my ability to walk and function like anyone else. I couldn't go to school, and even when I was home schooled I couldn't concentrate on learning due to the pain. I remember this period of time as one of the most difficult times in my life. For months, my parents and I searched for an answer to my pain. We visited countless doctors and specialists who all had different opinions. Some put me in a brace, others casted my foot thinking it was broken, and even one had me scheduled for surgery. It wasn't until we met Dr. Michael Tuman that we first learned about this disease called RSD. Finally we had the right diagnosis, but finding the right treatment led to a new search for my parents and I. Early on most of what we learned about RSD was pretty awful. We heard one bad story after another, and the video's we watched on YouTube portrayed RSD as this terrible debilitating disease that couldn't be treated. I remember feeling like my life was never going to be the same again. I was going to become like all these other people who were in constant pain, not able to live a normal life or ever be happy again. At first we could not find a treatment. RSD is rarely understood or studied by the medical community. Finally our efforts led us to a potential answer. We had heard about a doctor in Philadelphia who specialized in treating children with RSD pain. His name was Dr. David Dan Sherry. We had seen his video's and knew he was the right answer for us. We had to meet him! Unfortunately, and as many of you are already aware, this wouldn't happen quickly. We had to wait almost 6 months before we were admitted into the program. We learned there were kids from all over the country on a waiting list, desperately hoping they would be accepted into his program. Can you imagine living with pain all the time and not knowing if or when you would ever be treated. For most of us 6 months goes by like a blink of the eye, but when you're in pain every day, all the time, 6 months can feel like eternity. So we had to wait, and while we did, my parents dedicated themselves entirely to me during this difficult time. We crafted a program at home, similar to what we saw them do at CHOP, and this became the main focus of our lives. We had so much love and support all around us, and that is what helped us to get through this very difficult time in our families life. Eventually, I was accepted into the program, and finally knew I would get the help I needed. The Children's Hospital of Philadelphia, (CHOP) along with Dr. Sherry, nurse Deb, and the rest of the staff, provided me with the program I needed to help treat and manage my pain. I was one of the lucky kids to be treated at CHOP, and I am very happy to share with you all that 3 years later, I am doing well. We have increased the number of physical and occupational therapists on the AMPS team, as well as hired a 2nd psychologist on staff, which has helped Dr. Sherry to increase patient treatment by more than 30%. We have been able to increase Social Work time from 2 days a week to full time in order to help collaborate with the children's teachers, while offering more support to patients parents and their families. We have brought on additional staff in order to increase the number of art and music groups being offered, as well as the addition of some new groups such as relaxation and yoga groups. We have been able to purchase computers and video equipment to produce videos of each child, so they and their parents can see the progress they are making while being treated at CHOP. We purchased other needed equipment including weights, yoga mats, desensitization units, Wii and Xbox connect programs. Our program is the model for a new treatment center opening in Kansas City, MO and another one slated to open soon in San Francisco. We offer Internship programs which allow Physical & Occupational therapists, as well as Psychologists, to train at CHOP at no cost to the centers that send them. We even pick up their transportation and housing costs to encourage the centers to participate in the programs developed at CHOP. We have done research studies using new instruments which can measure brain waves precisely including their location, speed and amplitude, in order to learn more about how the pain signal is amplified and how it changes after a child completes their treatment. We have concluded a 1 year long term outcome study that have found that after a year of treatment, not only do patients continue to improve in function and experience decreased pain levels, but they maintain their endurance 12 months after finishing the program. We are thrilled to report that with your generous support in the past, we have not only been able to help expand the RSD treatment program as outlined above, but together we have all helped to successfully treat significantly more children suffering from RSD pain. So, three years later I am writing you again asking for your on-going support to a cause that is very near and dear to my heart. With our collective support, we can continue to help treat more kids suffering from RSD pain, just like me, because of people like you who care and are willing to help! For this reason, I am most thankful this year to each of you for your love, friendship and generous support. As you may already be aware, our 13 year-old daughter Lexi has been suffering from a Central Nervous System Disorder called RSD Reflex Sympathetic Dystrophy. It is a terrible disease that can strike anyone at any time. There are many symptoms associated with RSD, but the most definable symptom is constant pain. I am sure it is difficult to imagine what it must be like to live with intense pain 24 hours a day, 7 days a week. And yet, people afflicted with RSD live this way, and unfortunately, now our Lexi does too. In some cases, RSD victims have what is also commonly referred to as amplified pain attacks. These are episodes of pain that go on for prolonged periods of time that raise pain levels beyond anything you can possibly comprehend - Lexi characterizes her pain levels as elevating to 30 on a scale of 1-10. The attacks last anywhere from 10-40 minutes and they render Lexi in a state of post traumatic shock once they end. These attacks occur daily and they stand out as the single most traumatic moments in our family's life to date. I know this all sounds awful, and it is, but there is some encouraging news that we can share with you. 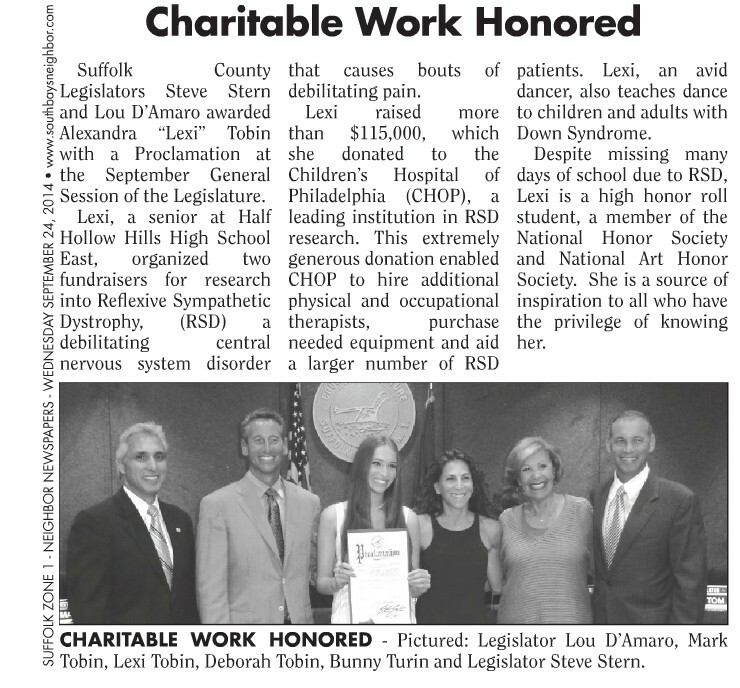 Along the way, our research for a treatment and a potential cure for Lexi's RSD led us to Dr. David Sherry, a leading physician at The Children's Hospital of Philadelphia (CHOP), who specializes in the treatment of Pediatric RSD. This is a man who has dedicated his life to helping children who suffer with RSD, and has helped to cure 1,800 children so far. Dr. Sherry's approach to treating RSD utilizes a combination of Intensive Physical & Occupational Therapies (PT/OT) to stimulate Lexi's blood flow, regain her muscle strength and mass, and help her to retrain the sympathetic nerves, which are the root cause of her elevated pain levels. The treatment involves the real application of mind over matter, whereby Lexi must push through the pain and restore function to her feet first before the pain begins to subside. Basically speaking, disregard the pain and simply start walking again. Not so easy when the pain you experience is equivalent to thousands of needles jabbing, knives stabbing, severe burning, electric shocks, or bones crushing. This treatment appears counter intuitive to anything we would normally do when we experience pain, but in the case of RSD, it is exactly what "the Dr. ordered". So how do you do that? How do you muster up the courage to withstand intense levels of pain in order to get better? Nike said it best . . . "Just Do It!" Fortunately for Lexi, we found Dr. Sherry. Unfortunately, he has limited resources and can only treat six patients at a time. As a result, his waiting list for treatment is as long as a year. Until then, we were on our own, and we were certainly unwilling to stand by and sit idle while Lexi suffered in silence. So, we chose to take matters in our own hands - literally. We gathered as much information we could about what, how and why Dr. Sherry did what he does at CHOP. From this we crafted our own in-home treatment plan that involved a variety of strategies including desensitization, weight bearing exercises, aerobics and the utilization of various distraction techniques to mask this painful process. Deb and I took on the role of coach and physical therapist, while having to put "mom" and "dad" on the shelf for several hours each day. We even gave ourselves fictitious names. Deb was Dr. Strawb(erry) and I was Dr. Blueb(erry). These are some of Lexi's favorite fruits, which we knew, and we wanted to find some form of kinship with Dr. Sh(erry). In addition to the in-home therapies we administer, Lexi's days are filled with professional treatment as well. She had aqua treatment for a while, along with daily visits to the physical therapy center. By the time each day was done, Lexi had put in a solid 6 hours of aggressive PT/OT. However, there was not much downtime because we were fortunate to have Lexi's teachers from Half Hollow Hills Middle school come to our home to help home school Lexi. Each teacher would come once a week to teach their subject for two hours. Lexi had homework, quizzes and tests like everyone else, and did well this marketing quarter, despite her difficult situation. There is more good news to report. Lexi is slowly on the mend and making good progress every day. Her spirits have improved, and we do have hope of putting this difficult chapter in our lives behind us sometime soon. Lexi is still crutch walking, but might be ready to take her first steps in months without them shortly. We may need the help of CHOP to get there, but continue to work aggressively at home until that time comes. Then there is the "You" factor. Lexi is loved and she knows it. She knows it because you have shown your care and love for her in so many different ways. Whether it be your calls to check in, your emails, BBM's or iChat's, your notes of encouragement or get well cards, your gift baskets or dinner platters, and most importantly your time, we can't begin to thank you all enough for the out pouring of love and support we have received from you. They say you find out who your real friends are when things get difficult, and for us we have learned a real lesson in life about what good friends are truly made of. For this we are eternally grateful. Today, Lexi still has RSD. Lexi still lives in constant pain. 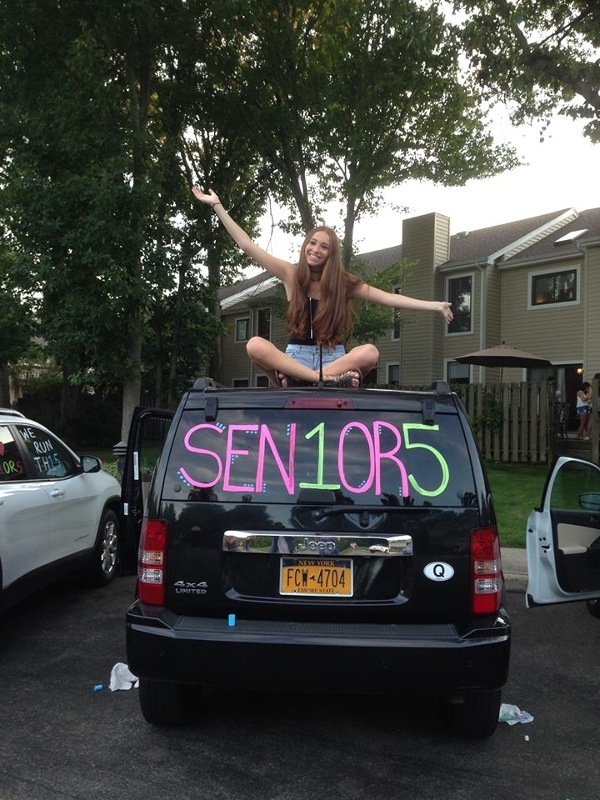 She is still out of school, and spends most of her day working to push thru the pain caused by RSD. Basically, life is on hold, but hopefully not for much longer. One day, the RSD will be gone - we firmly believe that. However, the impact this disease has had on Lexi, our entire family, and perhaps our friends will remain with us always. Our perspectives on things have changed greatly. They say there is a silver lining in everything that happens in life - ours are several. Today, we are stronger both as individuals and as a family. The definition of true friendship has been tested, although not by choice, and so many of you came to our aid. We now understand better what it means for others who suffer with whatever it is they have, and we are more compassionate and giving. We have a better sense of how we can focus our attention towards helping others in need, and providing support in any way we can. So, I began this letter to you by stating RSD can happen to anyone at anytime, but what I did not say is this may have happened to Lexi for a reason. It happened to us because we can make a difference. We will start now with RSD, but eventually this can and will become something much broader than any one disease. It really comes down to this one simple thing for us: In life, people will need our help along the way . . . we will help them! So many people have reached out to us, asking us how they can help. So here is a way. With your help, we hope to achieve our initial goal to raise $100,000 in support of Dr. Sherry and his programs. This is a good start toward providing Dr. Sherry with some additional resources needed to increase his staff levels, so he can treat more children like Lexi who must patiently and painfully wait for his help. It can also provide Dr. Sherry with the resources needed to provide valuable content and information regarding his treatment protocol, so parents and professionals can administer their own treatment plans at home. We hope you will join us through your generous tax deductable contribution to aid Dr. Sherry in helping Lexi, and other children who are afflicted with RSD. Donations received in Lexi's name will be targeted specifically to fund some of Dr. Sherry's main priorities in treating pediatric RSD. Whatever help and support you can provide is greatly appreciated. On behalf of Lexi, Deb and our entire family, we want to thank you all for your care, love and support during these difficult times.